Express shipping is not available for this item. 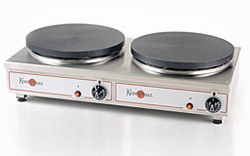 Eurodib Krampouz 16 Inch Gas Double Crepe Griddle CGCIM4. Two 15.5 inch cast iron cooking surfaces, stainless steel exterior. Each griddle has three heating elements that provide even heat distribution. Heats the griddle up to 575°F for fast cooking and quick recover times. Insulated burners. Sturdy, protective bar. Precise thermostatic temperature control. Availability: Usually ships within 10-14 business days.